Testosterone boosters are big business at the moment, so when I was approached by a company called Explicit Nutrition to test out their new ‘Testoturbo’ supplement, I was naturally a bit sceptical – was this going to be just another one of these all-talk and no-action boosters that have become commonplace on the internet? Having been willing to send over a sample for review, Explicit Nutrition clearly believe in their product (they could have simply relied on fabricated reviews like those that so many others do) which piqued my interest somewhat. In addition, the company is keen to point out that Testoturbo is backed by real scientific studies, which is always a good sign. Anyway, I tried it and here is what I thought. With any supplement, taste is always a big factor – if you don’t like the taste of something, you’ll be less likely to ingest it. Testoturbo scores very highly in the taste test, simply because it does not have a taste at all! The supplement comes in capsule form and, as five capsules need to be taken, the fact that it is tasteless is of real benefit. It is also worth mentioning that these tablets do not really give off any bad smell. Some testosterone boosters give off a real stench when you open the bottle, which can be very off-putting, so the fact that these barely give off any aroma (they do have a slight smell if you sniff up real good) is a definite bonus. The directions of the Testoturbo bottle say that five capsules must be taken with water in the morning before breakfast. This does seem like quite a lot to take in one dose, but the capsules digest really well. Never once when using the product did I suffer from stomach pyrosis or any kind of digestion problems. Testoturbo is advertised as a natural product with no (negative) side effects and, true to its word, no adverse effects were felt after taking the capsules. 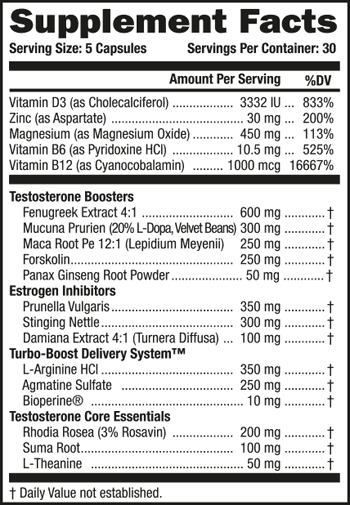 Testoturbo costs $59.99 for a large bottle of 150 capsules. Taking five capsules a day, a bottle will last 30 days – this about what you’d expect to pay for similar testosterone boosters. However, Explicit Nutrition does score points over the competition in the value-for-money stakes by providing a more functional product. Okay, so the product is nice to use and is well priced, but you and I know both know that all that really matters is whether Testoturbo works or not. Well, the great news is, it does! After just a couple of days of taking the capsules, I noticed a marked improvement in mood and libido. I began to feel more energetic within four or five days and was gaining strength with lifts after a week. After using the product, the drop in testosterone was noticeable but there were no adverse effects, which is great as coming off some boosters can leave you down and moody. There is certainly no lack of choice when it comes to testosterone boosters; however, having tested numerous supplements, I can honestly say that Testoturbo is one of the best. Taking five capsules a day might be a bit much for some, but if you’re looking to get fit and stay focussed, this product comes highly recommended. It seems really promising. I’m definitely going to try it! Copyright © 2015 JackedGorilla.Com | All rights reserved.